Published online: March 28, 2019. Certain genetic disorders (such as those associated with the BRCA1, BRCA2, PALB2, and ATM genes). The American Joint Committee on Cancer (AJCC) has designated staging by TNM (tumor, node, metastasis) classification. 0 Tis, N0, M0 Tis = Carcinoma in situ. This includes high-grade pancreatic intraepithelial neoplasia (PanIn-3), intraductal papillary mucinous neoplasm with high-grade dysplasia, intraductal tubulopapillary neoplasm with high-grade dysplasia, and mucinous cystic neoplasm with high-grade dysplasia. aReprinted with permission from AJCC: Exocrine Pancreas. In: Amin MB, Edge SB, Greene FL, et al., eds. : AJCC Cancer Staging Manual. 8th ed. New York, NY: Springer, 2017, pp. 337–47. Tis = Carcinoma in situ. This includes high-grade pancreatic intraepithelial neoplasia (PanIn-3), intraductal papillary mucinous neoplasm with high-grade dysplasia, intraductal tubulopapillary neoplasm with high-grade dysplasia, and mucinous cystic neoplasm with high-grade dysplasia. 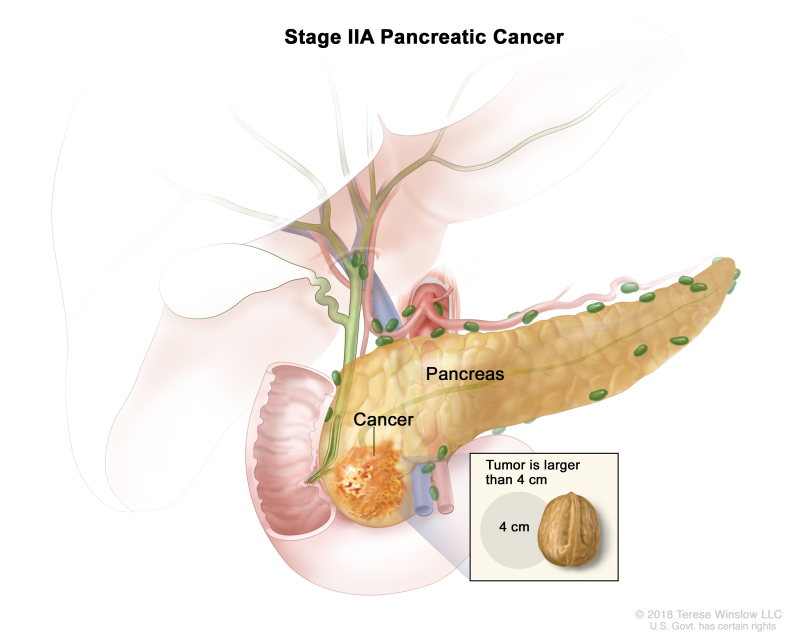 Approximately 20% of patients present with pancreatic cancer amenable to local surgical resection, with operative mortality rates of approximately 1% to 16%. [12-16] Using information from the Medicare claims database, a national cohort study of more than 7,000 patients undergoing pancreaticoduodenectomy between 1992 and 1995 revealed higher in-hospital mortality rates at low-volume hospitals (<1 pancreaticoduodenectomy per year) versus high-volume hospitals (>5 per year) (16% vs. 4%, respectively; P < .01). Historically, multiple randomized trials have established that adjuvant gemcitabine monotherapy  or adjuvant 5-FU monotherapy  improve overall survival (OS) for 6 months after surgical resection compared with surgery alone. More recent studies have looked at newer combination regimens that might further improve outcomes after surgical resection. For patients with good performance status, adjuvant FOLFIRINOX (oxaliplatin leucovorin, irinotecan, and 5-FU) chemotherapy or the combination of gemcitabine and capecitabine should be considered. However, for older patients or patients with marginal performance status, adjuvant gemcitabine or 5-FU monotherapy can be considered. In Asia, S-1 (tegafur-gimeracil-oteracil potassium) is an appropriate alternative to gemcitabine-based therapies. With a median follow up of 33.6 months, median disease-free survival (DFS) was 21.6 months with FOLFIRINOX and 12.8 months with gemcitabine (hazard ratio [HR], 0.58; 95% confidence interval [CI], 0.46–0.73, P = .001). Median OS was 54.4 months with FOLFIRINOX and 35.0 months with gemcitabine (HR, 0.64; 95% CI, 0.48–0.86, P = .003). Toxicity was higher with combination therapy; 75.9% of patients treated with FOLFIRINOX had grade 3/4 toxicities (compared with 52.9% of those who received gemcitabine), with similar rates of neutropenia (although 62.2% of patients on FOLFIRINOX received granulocyte colony-stimulating factor). Thirty-three percent of patients who received FOLFIRINOX stopped treatment prematurely, compared with 21% of patients who received gemcitabine alone. Gemcitabine: Charité Onkologie (CONKO)-001 was a multicenter phase III trial of 368 patients with resected pancreatic cancer who were randomly assigned to receive six cycles of adjuvant gemcitabine versus observation. [Level of evidence: 1iiDii] In contrast to the previous trials, the primary endpoint was DFS. Median OS was 23.0 months (95% CI, 21.1–25.0) for patients treated with 5-FU plus leucovorin and 23.6 months (95% CI, 21.4–26.4) for those treated with gemcitabine (HR, 0.94; 95% CI, 0.81–1.08; P = .39). U.S. Gastrointestinal Intergroup: The U.S. Gastrointestinal Intergroup has reported the results of a randomized phase III trial (Radiation Therapy Oncology Group [RTOG]-9704) that included 451 patients with resected pancreatic cancers who were assigned to receive either postoperative infusional 5-FU plus infusional 5-FU and concurrent radiation or adjuvant gemcitabine plus infusional 5-FU and concurrent radiation. [Level of evidence: 1iiA] The primary endpoints were OS for all patients and OS for patients with pancreatic head tumors. A 5-year update of RTOG-9704 reported that patients with pancreatic head tumors (n = 388) had a median survival and 5-year OS of 20.5 months and 22% survival rate with gemcitabine, versus 17.1 months and 18% with 5-FU (HR, 0.84; 95% CI, 0.67–1.05; P = .12). The EORTC/U.S. Gastrointestinal Intergroup RTOG-0848 phase III adjuvant trial evaluating the impact of chemoradiation therapy after completion of a full course of gemcitabine with or without erlotinib is currently enrolling patients. Additional trials are still warranted to determine more effective systemic therapy for this disease. Gemcitabine and nab-paclitaxel (APACT [NCT01964430]). 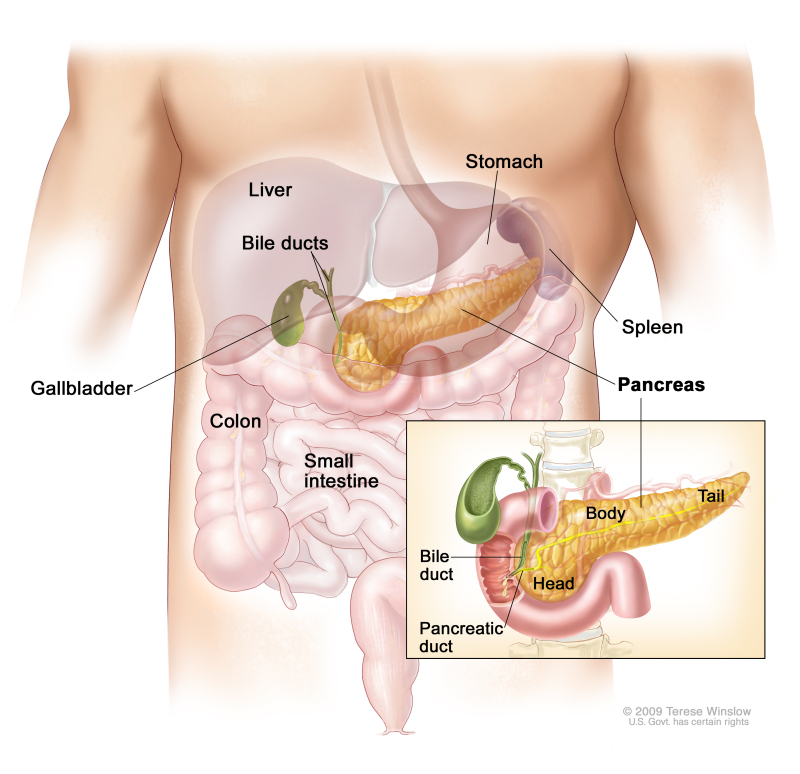 Chemotherapy is the primary treatment modality for patients with locally advanced pancreatic cancers and uses the same regimens as those used to treat patients with metastatic disease. The addition of erlotinib modestly prolonged survival when combined with gemcitabine versus gemcitabine alone (hazard ratio [HR], 0.81; 95% confidence interval [CI], 0.69–0.99; P = .038). The median overall survival (OS) was 8.5 months in the nab-paclitaxel/gemcitabine group compared with 6.7 months in the gemcitabine group (HRdeath, 0.72; 95% CI, 0.62–0.83; P < .001). The median OS was 11.1 months in the FOLFIRINOX group compared with 6.8 months in the gemcitabine group (HRdeath, 0.57; 95% CI, 0.45–0.73; P < .001). Median progression-free survival was 6.4 months in the FOLFIRINOX group and 3.3 months in the gemcitabine group (HR for disease progression, 0.47; 95% CI, 0.37–0.59; P < .001). FOLFIRINOX was more toxic than gemcitabine; 5.4% of patients in this group had febrile neutropenia. At 6 months, 31% of the patients in the FOLFIRINOX group had a definitive degradation of quality of life, versus 66% in the gemcitabine group (HR, 0.47; 95% CI, 0.30–0.70; P < .001). 5-FU, leucovorin, and oxaliplatin (OFF regimen) versus best supportive care (BSC): Second-line chemotherapy after progression on a gemcitabine-based regimen may be beneficial. The Charité Onkologie (CONKO)-003 investigators randomly assigned patients in the second line of chemotherapy to either the OFF regimen or BSC. ; [Level of evidence: 3iA] The OFF regimen consisted of leucovorin (200 mg/m2) followed by 5-FU (2,000 mg/m2 [24-hour continuous infusion] on days 1, 8, 15, and 22) and oxaliplatin (85 mg/m2 on days 8 and 22). After a rest of 3 weeks, the next cycle was started on day 43. The trial was terminated early because of poor accrual, and only 46 patients were randomly assigned to either the OFF regimen or BSC. Median survival on second-line chemotherapy was 4.82 months (95% CI, 4.29–5.35) with the OFF treatment regimen and 2.30 months (95% CI, 1.76–2.83) with BSC alone (HR, 0.45; 95% CI, 0.24–0.83). 5-FU = 5-fluorouracil; ECOG = Eastern Cooperative Oncology Group; FFCD = Fédération Francophone de Cancérologie Digestive; GEM = gemcitabine; GITSG = Gastrointestinal Tumor Study Group; Gy = gray (unit of absorbed radiation of ionizing radiation); P value = probability value; XRT = x-ray or radiation therapy. Three trials attempted to look at combined modality therapy versus radiation therapy alone. [14-16] The trials had substantial deficiencies in design or analysis. Initially, the standard of practice was to give chemoradiation therapy based on data from the first two studies; however, with the publication of the third study, standard practice has changed to chemotherapy followed by chemoradiation in the absence of metastases. The primary endpoint was OS. After interim analysis, the study was stopped early because of futility. With a median follow-up of 36.7 months, the median OS from the date of the first randomization was not significantly different between chemotherapy at 16.5 months (95% CI, 14.5–18.5 months) and chemoradiation therapy at 15.2 months (95% CI, 13.9–17.3 months, P = .83). The LAP07 study represents the most robust, prospective, randomized phase III data regarding the role of chemoradiation therapy in the setting of gemcitabine-based induction chemotherapy that demonstrates no OS benefit. However, this study was initiated before the advent of FOLFIRINOX chemotherapy, which has been widely adopted into the locally advanced setting. The role of chemoradiation in the setting of more active chemotherapy regimens, including gemcitabine/paclitaxel and FOLFIRINOX, has yet to be evaluated. Eastern Cooperative Oncology Group (ECOG) E-8282 trial: Investigators from the ECOG randomly assigned 114 patients to receive radiation therapy (59.4 Gy) alone or with concurrent infusional 5-FU (1,000 mg/m2/d on days 2–5 and 28–31) plus mitomycin (10 mg/m2 on day 2). 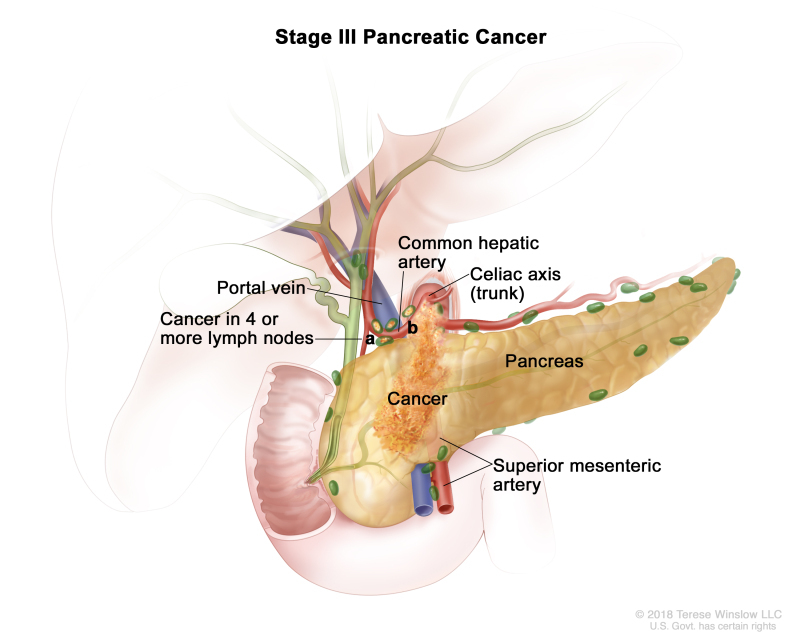 A significant proportion (approximately one-third) of patients with pancreatic cancer will present with stage III or locally advanced disease. 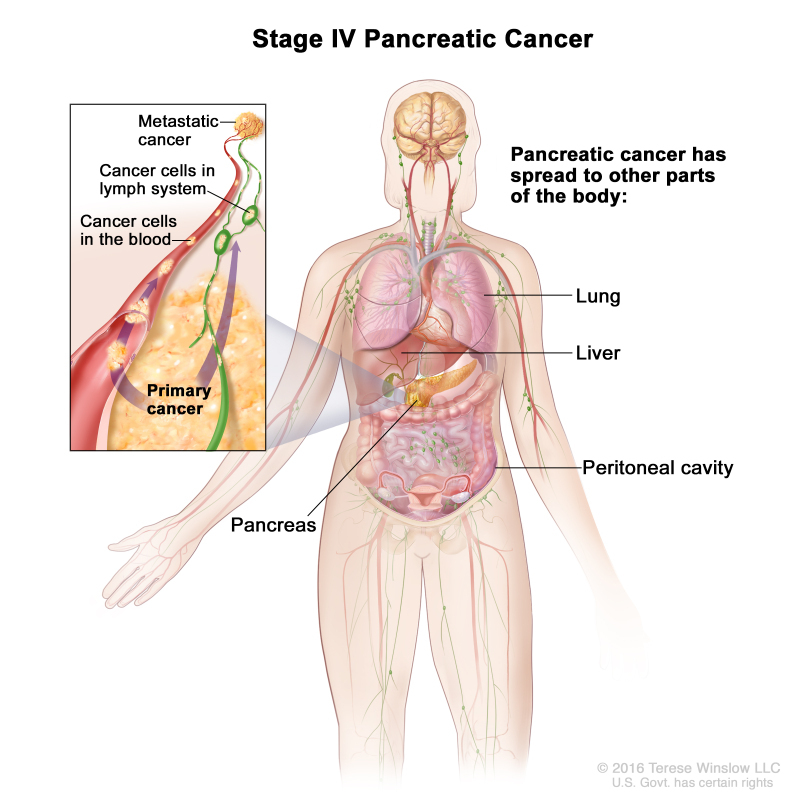 Patients with stage III pancreatic cancer have tumors that are technically unresectable because of local vessel impingement or invasion by tumor. However, with the combination of chemotherapy and chemoradiation, some patients may become surgical candidates. Patients may benefit from palliation of biliary obstruction by endoscopic, surgical, or radiological means. The median overall survival (OS) was 11.1 months in the FOLFIRINOX group compared with 6.8 months in the gemcitabine group (hazard ratio [HR]death, 0.57; 95% confidence interval [CI], 0.45–0.73; P < .001). FOLFIRINOX was more toxic than gemcitabine; 5.4% of patients in this group had febrile neutropenia. At 6 months, 31% of the patients in the FOLFIRINOX group had a definitive degradation of quality of life versus 66% in the gemcitabine group (HR, 0.47; 95% CI, 0.30–0.70; P < .001). The addition of erlotinib modestly prolonged survival when combined with gemcitabine alone (HR, 0.81; 95% CI, 0.69–0.99; P = .038). The benefit of using nanoliposomal irinotecan rather than unencapsulated irinotecan has not been established because the regimen for the control arm of this study was 5-FU/folinic acid. Additionally, the value of using nanoliposomal irinotecan after FOLFIRINOX in the first-line setting is not clear. 5-FU, leucovorin, and oxaliplatin (OFF regimen) versus best supportive care (BSC): Second-line chemotherapy after progression on a gemcitabine-based regimen may be beneficial. The Charité Onkologie (CONKO)-003 investigators randomly assigned patients in the second line of chemotherapy to either an OFF regimen or BSC. ; [Level of evidence: 3iA] The OFF regimen consisted of leucovorin (200 mg/m2) followed by 5-FU (2,000 mg/m2 [24 hours continuous infusion] on days 1, 8, 15, and 22) and oxaliplatin (85 mg/m2 on days 8 and 22). After a rest of 3 weeks, the next cycle was started on day 43. The trial was terminated early because of poor accrual, and only 46 patients were randomly assigned to either the OFF regimen or BSC. 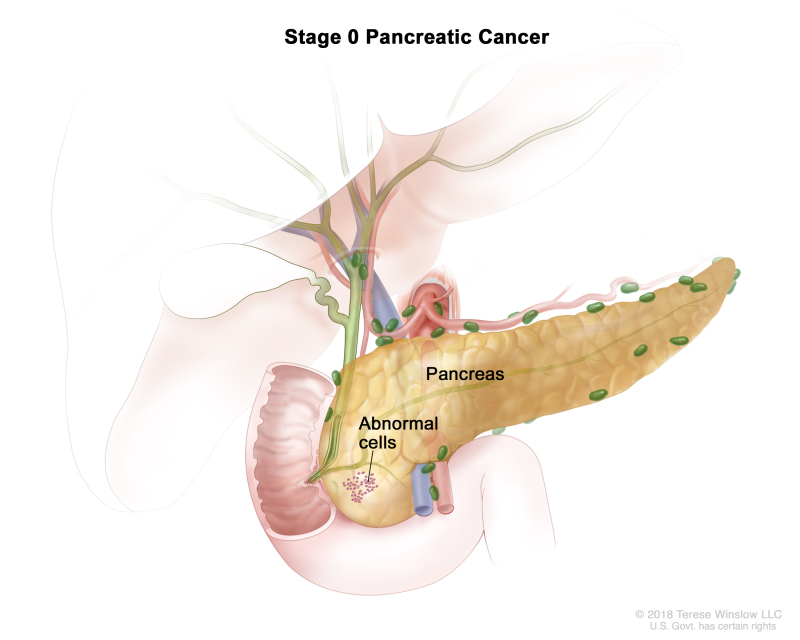 Expanded the list of risk factors for pancreatic cancer to include certain genetic disorders. Added text to the surgery subsection to state that concurrent systemic therapy is recommended for treatment. Revised text to state that for patients with good performance status, adjuvant FOLFIRINOX (oxaliplatin leucovorin, irinotecan, and 5-FU) chemotherapy or the combination of gemcitabine and capecitabine should be considered. Added that in Asia, S-1 (tegafur-gimeracil-oteracil potassium) is an appropriate alternative to gemcitabine-based therapies. Added text about PRODIGE-24, a randomized, open-label, phase III trial in which 493 patients with R0/R1 resections were randomly assigned to receive 6 cycles of gemcitabine or 12 cycles of FOLFIRINOX (cited Conroy et al. as reference 18). Revised treatment options under clinical evaluation to include gemcitabine and nab-paclitaxel and alternative radiation techniques. 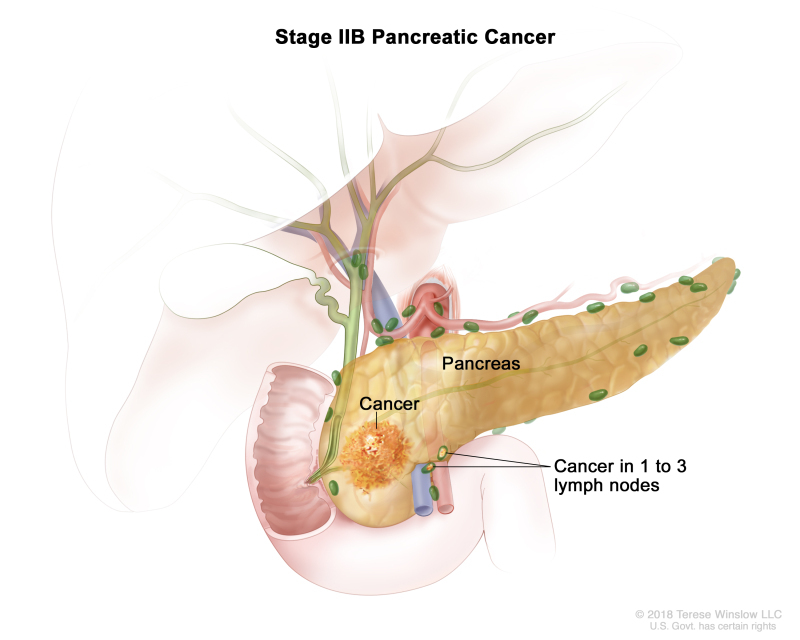 Revised text to state that chemotherapy is the primary treatment modality for patients with locally advanced pancreatic cancers and utilizes the same regimens as those used to treat patients with metastatic disease. Added text to state that with the combination of chemotherapy and chemoradiation, some patients may become surgical candidates. PDQ Adult Treatment Editorial Board. 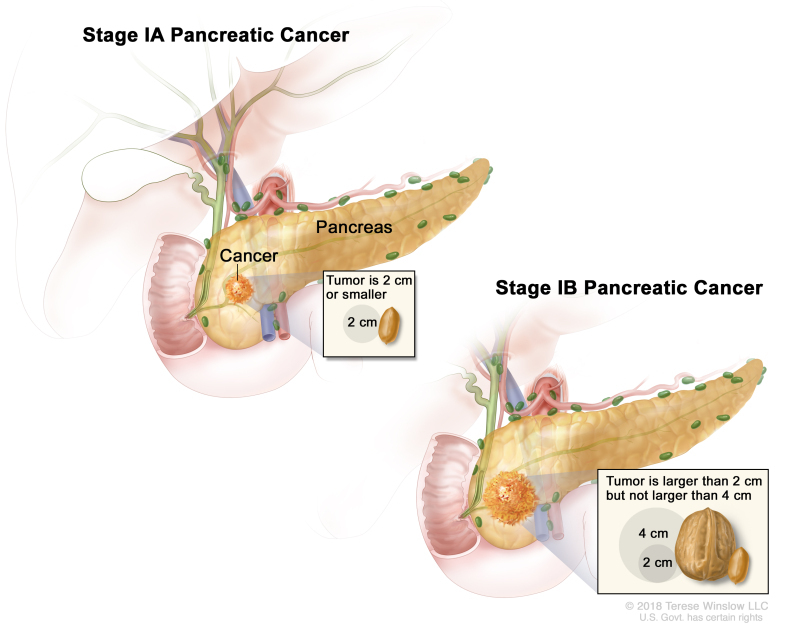 Pancreatic Cancer Treatment (PDQ®): Health Professional Version. 2019 Mar 28. In: PDQ Cancer Information Summaries [Internet]. Bethesda (MD): National Cancer Institute (US); 2002-.